Bullhead is a tragic drama that deserves its nomination, if not more. It’s ultimately a film about an irreversible destiny and how a man chooses to live with it. Every year there seems to be one foreign film that takes the Oscars by storm. The film usually earns the praise and this year’s Bullhead is no exception. It rightfully earns itself the nomination and if it were made by an American director I could see the film getting the general best picture nod as well as best actor. Bullhead is a different kind of gritty crime film, but it still shows the same characteristics that most genre films have. It’s violent, dark and offers more than one reprehensible character. But at Bullhead‘s center is one man that’s flawed, damaged and crazy by most standards, but he’s just really misunderstood. Actor Matthias Schoenaerts plays that character and he drives the film above and beyond expectations, making Bullhead a bold film by newcomer director Michael R. Roskam. 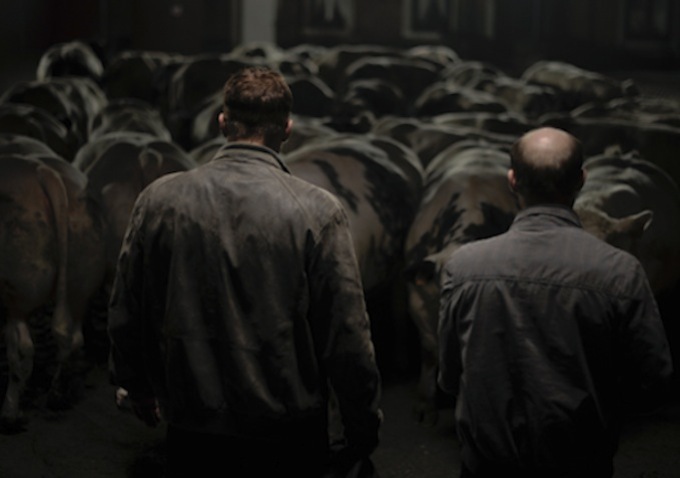 Jacky Vanmarsenille (Matthias Schoenaerts) is a cattle farmer. He’s been farming his whole life, following in the footsteps of his father. The world of cattle farming isn’t as subtle as it seems though, with notorious crime bosses making deals with farmers and pharmacists. Shady beef-traders mixed with drugs and rugged individual’s makes for a tragedy of a film that centers on Jacky, the misunderstood man with a difficult life based on one life-altering event. A childhood event physically and mentally altered his life forever, causing nothing but pain and lost opportunities. Jacky’s a lonely individual, but he keeps to himself because he doesn’t really know how to properly engage with others. He’s been around animals all of his life, caring for them and watching them care for each other, yet he doesn’t have anything of his own to care for. It’s a truly sad story, something that’ll breakdown just about any man, but it’s one that is told with a sharp eye. Director Michael R. Roskam combines a gritty crime film with an emotionally driven character study. Bullhead is very much the best of both worlds. From the crime aspect if follows various shady characters as they mix and mingle with even dirtier scum. There’s a big deal forming and both sides have their own baggage that needs to get cleared up before things can go smoothly. As usual, the cops aren’t too far behind, acting as a constant reminder of what little time is left for both parties. Bullhead works even better as a character study. You’re given a first-class ticket into the brain of Jacky and you get to witness the horrible event that he had to endure. You’re left with his adult self, who’s faced with confusing emotions. He’s a vulnerable individual who’s easily angered. He’s a physical beast of a man and that makes it all the harder for people to truly understand him. Actor Matthias Schoenaerts gives a truly unique performance as Jacky. He’s intimidating on the outside, but real simple on the inside. It’s very hard watching him struggle with basic things because he just can’t seem to properly react to given situations. The film follows his every move, allowing you to really soak in the characters problems. It’s hard watching him make the decisions that he does and it’s even harder watching the outcomes. But that’s what makes Bullhead so different from other films. It could have easily been just another foreign crime film, full of the usual gritty characters and violent twists and turns, but Bullhead is much more focused on telling a more personal story, while mixing in crime elements. It’s a sad story that goes in one, inevitable direction, but even knowing the general outcome of the film doesn’t affect its impact. I couldn’t take my eyes off the screen until the very end and I’d oftentimes hope things would go in a different direction, despite knowing that it just wasn’t possible. Bullhead is a tragic drama that deserves its nomination, if not more. It’s ultimately a film about an irreversible destiny and how a man chooses to live with it.